Crawford Falconer will take up the post of chief trade negotiation adviser at the Department for International Trade. Leaving the single market would mean the UK would have to establish new bilateral trade agreements, but cannot formally do so until after Brexit. However, one economist suggested Mr Falconer would already be "building bridges" with the European Commission. The UK faces a huge challenge in resetting its trading relationship with the EU and other countries when Brexit takes effect. A New Zealander, Mr Falconer has more than 25 years trade experience. He has represented New Zealand at the World Trade Organization (WTO) and held various posts in foreign and trade affairs in his home country. Prof Alan Winters, from the University of Sussex's UK Trade Policy Observatory, said Mr Falconer's experience and contacts at the WTO would mean the groundwork for separating UK trade policy from Brussels would be made easier. "He knows quite a lot of the main players at the WTO and can build bridges at the European Council, which is good as there is work to be done right now," he said. "There is work he can do, such as discussions on whether the UK uses replicas or changes trade agreements that we have with nations by way of membership with the EU." One suggestion has been that initially trade agreements could be adopted by the UK in their current form - replicating them - at the point of Brexit, to be altered subsequently as new deals are agreed. International Trade Secretary Liam Fox said of the new appointee: "Crawford Falconer brings a wealth of international trade expertise to our international economic department, ensuring that as we leave the EU, the UK will be at the forefront of global free trade and driving the case for international openness." 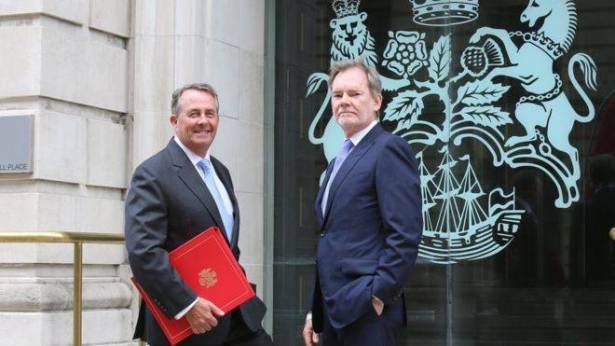 Mr Falconer will lead trade policy and negotiation teams at the DIT. His appointment was first announced in June.